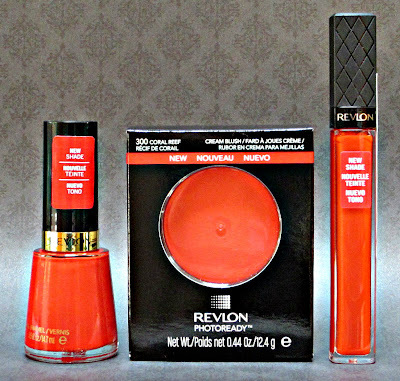 Revlon Escapism Collection Birthday Giveaway! Revlon's Summer 2012 Escapism Collection has some beautiful products in it, and I've picked up quite a few for myself over the last couple of weeks. I also picked up some extra items for another Birthday Month Giveaway! I'm a huge fan of Pantone and their color matching system, so when they announce their Color of the Year, it's guaranteed that I'll be sucked in by their marketing. Cosmetics companies and fashion lines don't help me any when they take part in this ploy to attract our attention to their products, which are often inspired by Pantone's Color of the Year. Needless to say, my closet now has quite a few more Tangerine items in it than it did last year at this time! It goes without saying that my make up and nail polish collections have also increased, solely because of the 2012 Color of the Year. If you'd like to enter for a chance to win these products and share in my love for this color, just leave your eMail in the comments section below. Let me know if you've expanded your wardrobe, your home decor items, your cosmetics, or your accessories this Spring/Summer with anything Tangerine! If you aren't comfortable leaving your eMail, please check back on Monday, July 2, when I announce the winner. This is open to International followers also. Contest ends at midnight, July 1. I've bought several tangerine nail polishes and a bracelet and shirt. Woah! This is awesome! I had added a tangerine dress and a nail polish to my collection! Love it! I've bought an EOS lipbalm in tangerine, since it's my favourite. And a gorgeous scarf as well! I'm currently sporting loud coral/tangerine-ish nails. It's a beautiful color for summer! I've been LOVING the tangerine this year. I'm cool toned and pale so orange can look a bit harsh on me. But I don't care! I wear it anyway! Although oranges and tangerines have become some of my favorite colors recently, none of it exists in my wardrobe :( I'm one of those people that are afraid of some color in their outfits! Even though my pinterest board shows otherwise ;) haha! I'm just reusing oranges and corals from my makeup collection. As for shoes / clothes, I didn't add any tangerine items because this color doesn't look great on me because of my skin tone. I haven't bought any tangerine yet. Tangerine nail polish!! The color doesn't even look that good on me, in my opinion. (At least not as a full mani) But I've bought sooooo many! Blush is the only thing I have in the tangerine family. And no, I don't have anything new in tangerine. I generally detest shopping; my boyfriend has to drag me out clothes shopping, and I make him choose things for me to try on. I do love the Pantone color system, though, and I'm always incredibly fascinated by the colors that get chosen. Crazy, eh? I have an old chair which is tangerine, but it needs to be recovered - perhaps in another tangerine fabric! I only have gotten the sephora nail polish set. But am obsessed with light orange clothes this summer. I have gotten some colored jean shorts and a top. I've been wanting to try a lipstick but haven't seen the right color. This one looks super fun! Thanks for the giveaway. No, besides the nail polish I have already got. I did like the stuff sold by Sephora but the price kept me away. I've only bought a tangerine lipgloss. I've just got a new tangerine cardigan that I wear with everything now! I'm trying to learn to love it! I have always gravitated towards this type of color. It is a very happy type of color. I added a couple of tangerine polishes & lipsticks to my collection this year. I have been wearing a lot of coral nail polishes especially on my toes because it looks so beautiful! I have a statement tangerine necklace which just completes an outfit! I have bought TONS of tangerine and coral lipsticks and blushes. I've bought a lot of make up during my trip in London, and I just ordered Hello Kitty Face masks! For the clothes, sales start wednesday so I'll wait a bit! I've got the whole family in on the tangerine craze! I have a new tangerine top, I bought my husband a tangerine shirt for Fathers Day and I purchased shirts in tangerine for my two boys. Now I need the makeup to go with it! I've totally fallen prey to the Tangerine Tango mania! I've always had a weakness for orange polish going back to when I was a little girl and now I've broadened it to lipstick, gloss, etc. Just love it! i'm unemployed so i haven't bought myself anything in the last year! i would love to get a tan because bright tangerine looks hot on my skin! I did buy a new blush in this color and I love it - so I'd love to see how this one compares! I have been loving this color all summer long! I'd like to enter, but I'd rather not leave my e-mail address. I promise to check back when the contest is over. Thanks for so many generous give aways lately! I bought a lovely new lipstick, a top, and a bracelet all in that color! Lots of new tangerine polishes! I'm kind of boring so I haven't yet gotten anything in tangerine. I could definitely handle the nail polish! I'm currently sporting tangerine nails! I did purchase a nail polish that was tangerine.